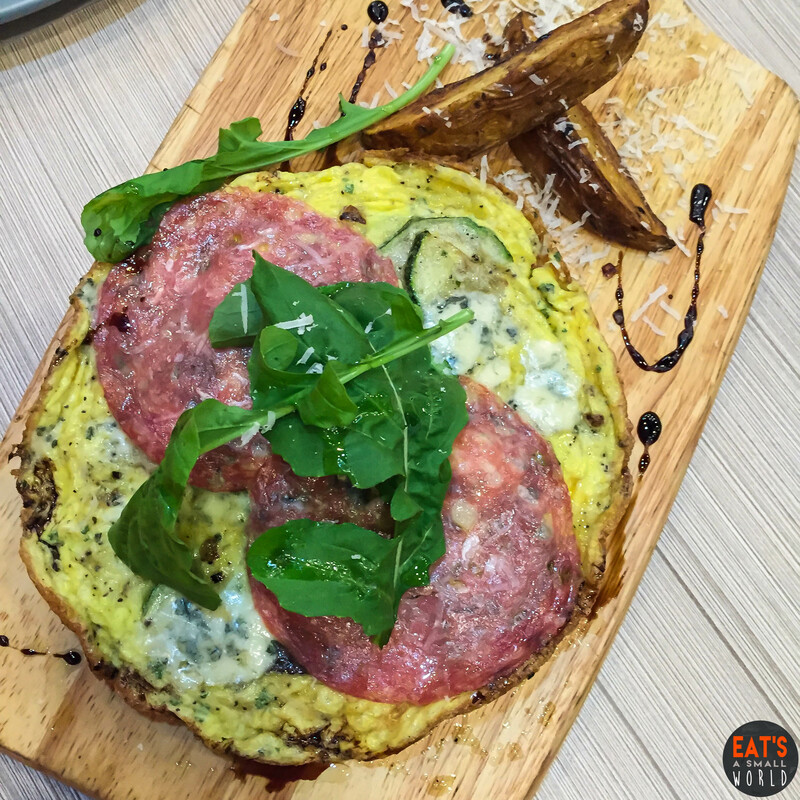 Don’t miss out this affordable and authentic Italian Lunch set in BGC! The BGC place has a more “casual dining” style as compared to the first branch in Dasmarinas Makati . A lot of people (especially the young executives) in BGC know Va Bene in Central Square and that is why we are not surprised that the restaurant gets full during lunch and dinner time despite being at the top most floor of the mall. 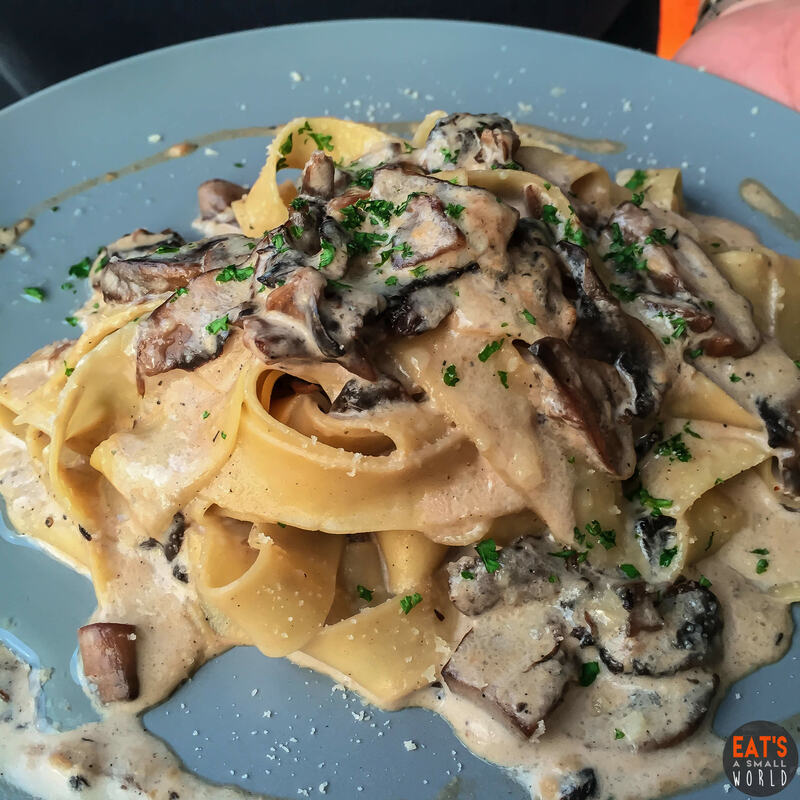 Definitely, these returning customers go back mainly because of one thing… their authentic Italian food that’s so irresistible and truly delicious. The restaurant is well-lit, very clean and looks “happy” most especially because of the warm orange color. It has “no-frills” and is well decorated. They offer you this delicious chopped tomatoes and olives in olive oil salad while waiting for your order. It whets your appetite and sets the mood for the coming delicious meals. Whenever I think of salad, it always seems to be boring. Those green leaves, and veggies are not appetizing at all to me. 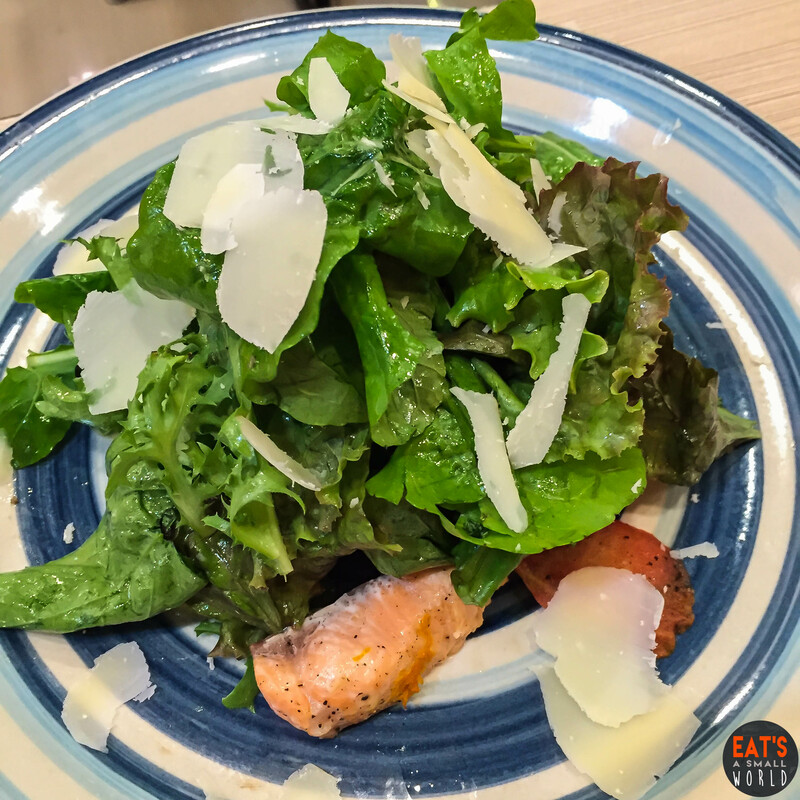 But when I tried Va Bene’s salad with slow cooked salmon and lemon dressing, it changed the way I look at salad. It’s so good, I didn’t notice I was about to devour the last arugula on my plate. What made it special is the nice blend of salmon and parmesan cheese. The fish was fresh and its distinct orange color made it look really appetizing. The lemon dressing highlighted the salmon’s flavor and when eaten with cheese and lettuce, it is simply delicious. Here’s another salad that you can choose from the available appetizers on the menu. Parma ham and blue cheese with lettuce (to balance the rich flavors) with hints of balsamic. It’s perfect for me because I really love blue cheese. Also, the tomato milanese (breaded tomato) is an exciting addition to the treat. Eccellente! Now this one is for the mushroom lover. It’s tasty and the earthy flavour of the sauteed mushrooms complement the creamy consistency of the polenta (Italian porridge). It is unique. Very Italian and we love it! This dish is one of my faves. It’s fully packed with protein! The braised pork is flavorful and tender (easy to eat). 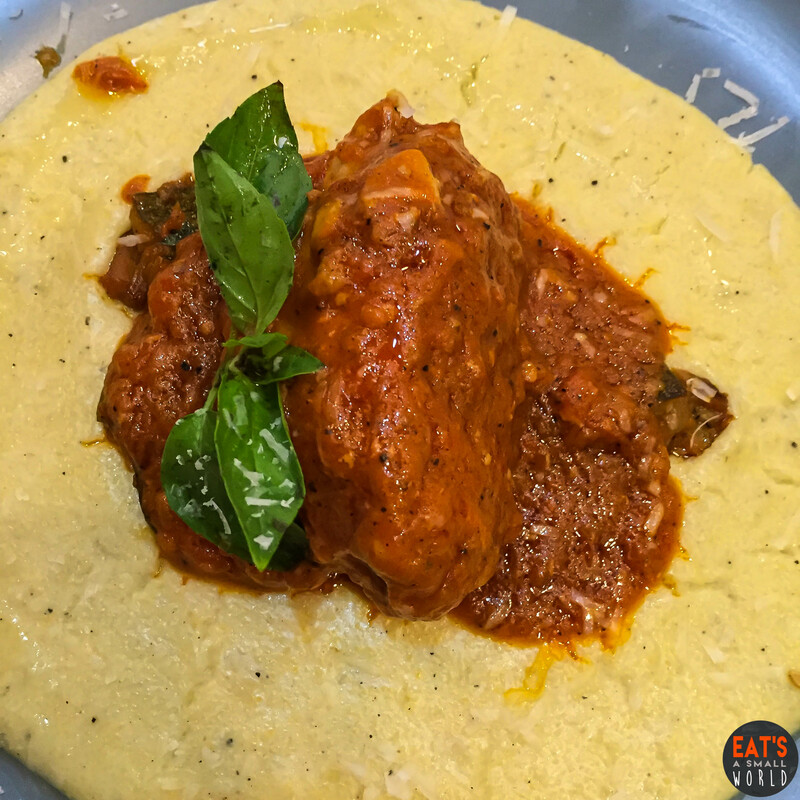 The polenta is perfect to balance the taste of the meat and tomato sauce. Together, it makes a really satisfying dish. This dish is perfect for those who are watching their calorie intake. The fritattata (similar to omelette) has a creamy flavor and is fluffy. It’s good when matched with the salami and fresh vegetables. It is a simple yet satisfying Italian dish. This pasta meal is extremely satisfying and surprisingly filling. 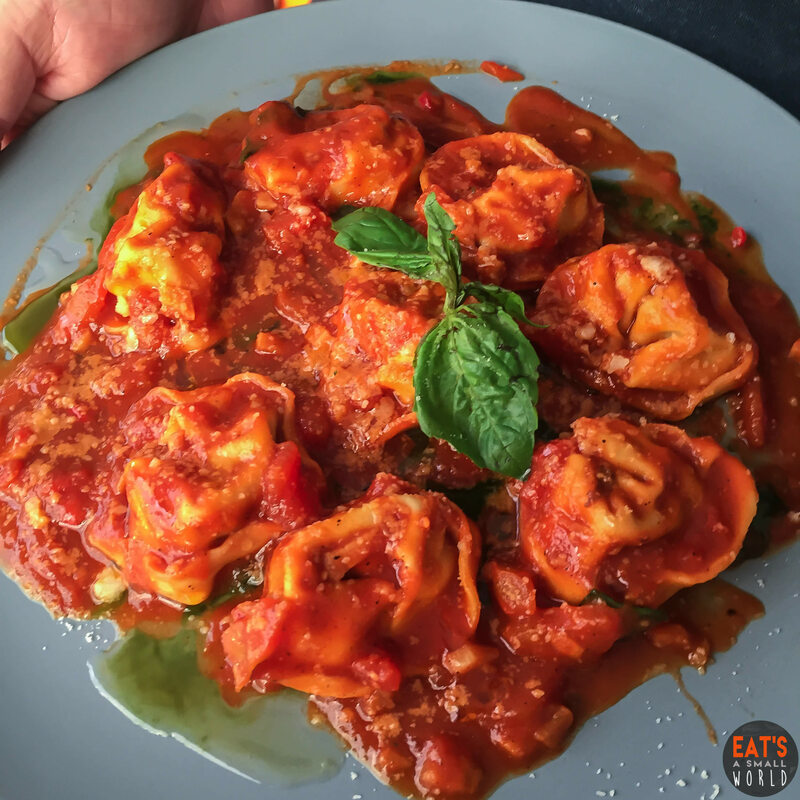 You won’t even realize what’s inside the ravioli if somebody ordered it for you (as a surprise). Very rich and elegant flavor. Vegetarians will love this. Up close, you can see it was drizzled with cheese and smothered with freshly made tomato sauce with herbs. To tell you honestly, if your looking for a healthy dish, then this must be it. It’s made of spinach which was cooked with herbs carefully chosen by Chef Massimo – truly a very innovative and creative chef. 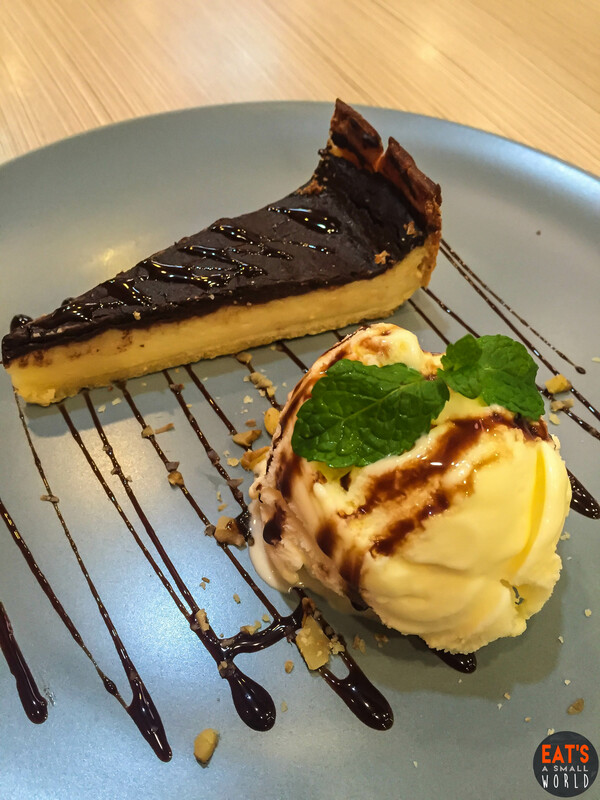 Our dessert choice is simple: Choco-Lemon pie that’s perfectly matched with vanilla ice cream, sprinkled with nuts and topped with chocolate sauce. A great way to end an Italian feast! We love Va Bene. We really do. While it serves authentic Italian dishes created by no less than a good-looking Italian master chef, the prices are surprisingly very reasonable. It is too bad that we can only featured these dishes now (our tummies can only accommodate so much) but wait till we come back and share with you more of Va Bene’s incerdibly delicious dishes. Amiamo Va Bene! 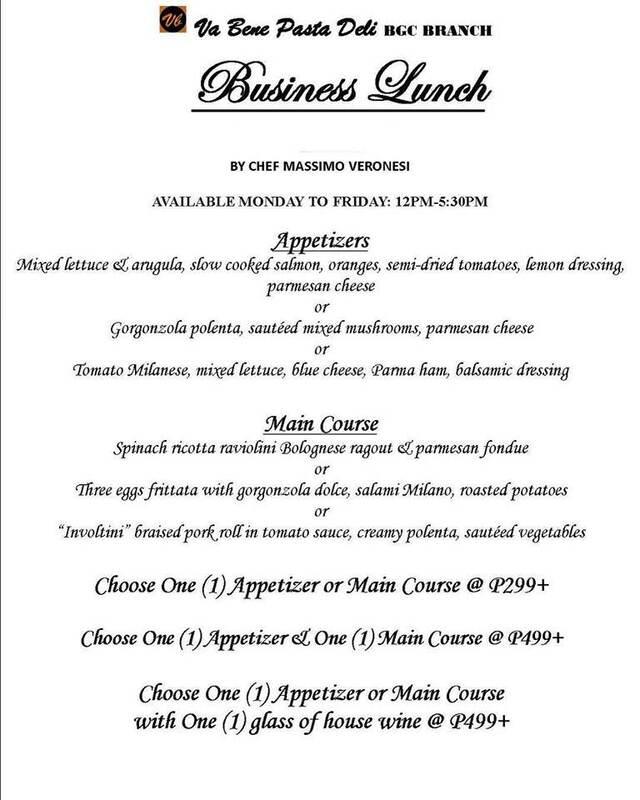 If you want to check out the full business lunch menu, take a closer look below. Take note that this is only available from 12 PM to 5:30 PM. It’s best to order an appetizer and main course combination, for a total of PHP 499.00 + ….now THAT IS very affordable. If you are on a strict diet, we suggest you to try their mixed lettuce salad with salmon and get the three eggs frittata for the main course. 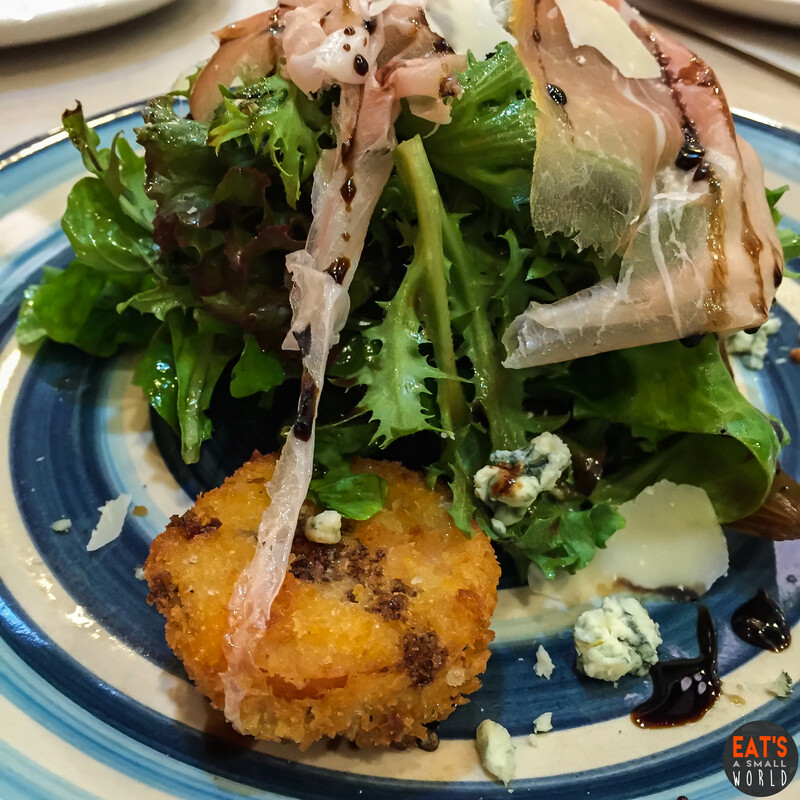 The tomato Milanese salad is also a good choice, especially for those who love blue cheese. 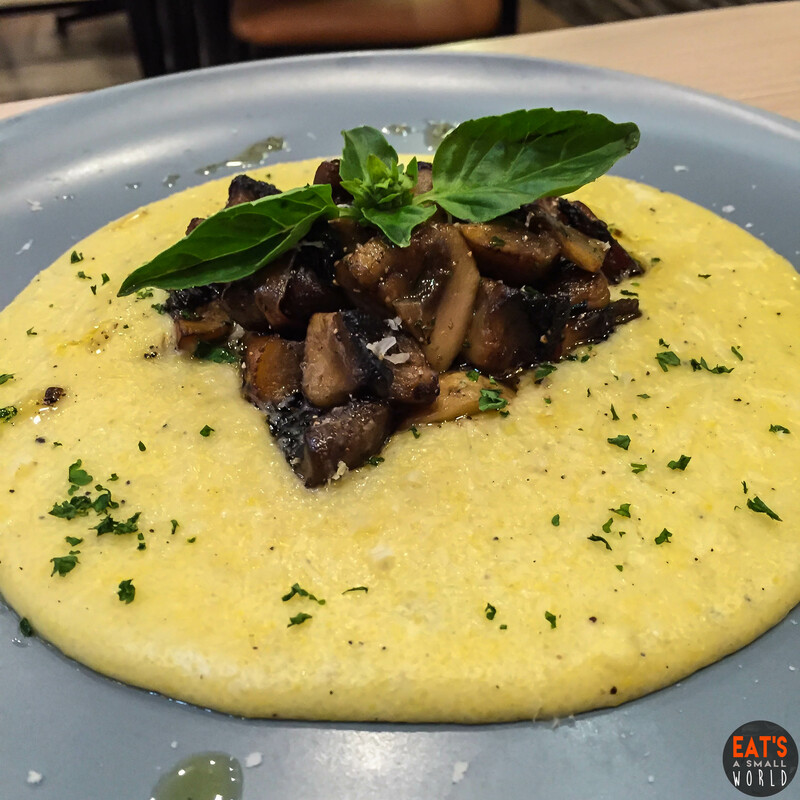 For the adventurous eater, you may want to start with the polenta with sauteed mushrooms (it’s really good!) and then order the braised pork for your main course. The spinach ricotta is also an excellent choice for those who are not eating animal meat. The earthy flavor of the mushrooms, most especially the dominant scent and taste of truffle (oil) is just so distinct, so very, very rich. If one is lucky that truffle is in season, slivers of this precious fungus are garnished onto the dish. However, if truffle is not in season, the truffle oil alone (in place of the fine, thin slices of the truffle) is enough to satisfy one’s palate. Its unique flavor is a bit of an acquired taste but to truffle addicts like me, this dish is sure to satisfy one’s taste buds. The version of Va Bene is “molto bene” (very good) as a matter of fact, it is “eccellente” (excellent)! Oh by the way, Va Bene DID NOT, DOES NOT, and WILL NOT EVER use “all purpose” cream in any of its white sauces. Doing so is considered a “culinary offense” by ALL Italian chefs and to pasta lovers like me, using “all purpose creme” is a major crime. 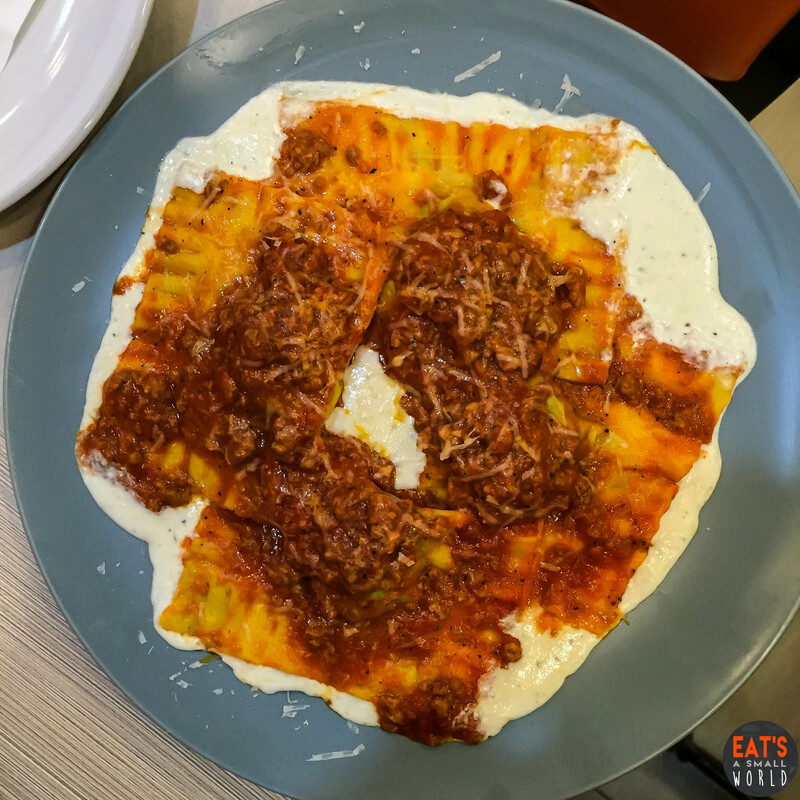 They also make their own pasta and this may be verified through their “open kitchen” in their Makati branch. 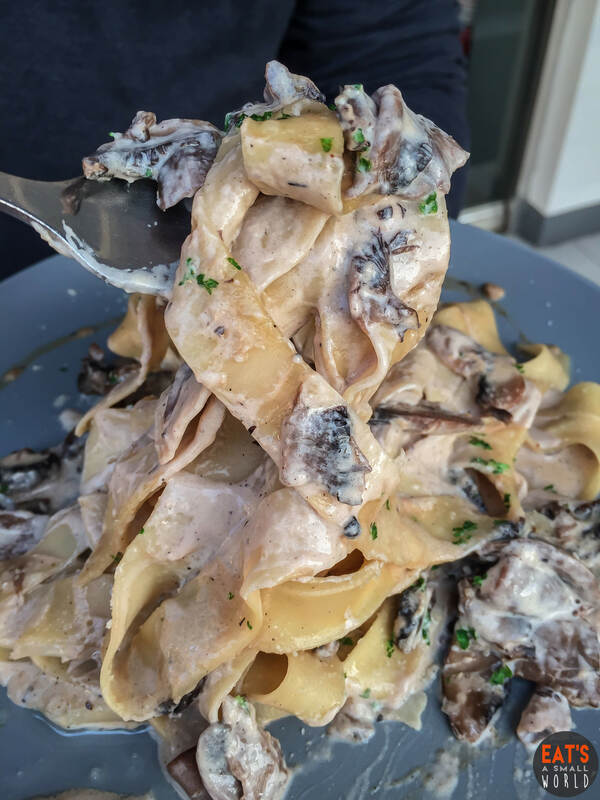 So rest assured that when you are dining at Va Bene, the quality of your pasta is “autentico”(authentic)! The rich taste of homemade arrabiata sauce and ravioli pasta mixed with basil pesto are so evident in this dish. It is like, when the waiter delivered the dish to our table, the aroma alone whet our appetites that we almost forgot to pray before devouring this dish. Yes, this ravioli pasta is as delicious as it looks. 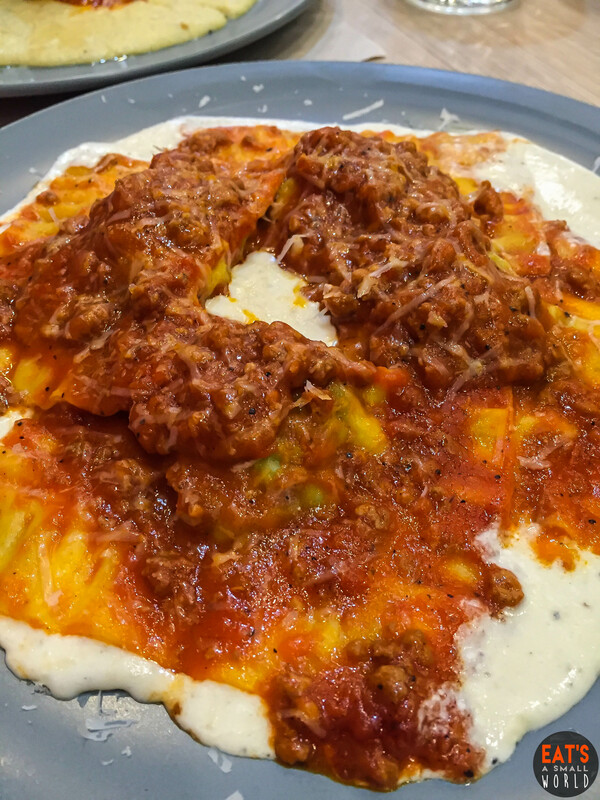 Rich tomato sauce poured over the ravioli stuffed with eggplant and seasoned with some other secret herbs and freshly ground pepper is just simply “delizioso” (delicious)! If you are a regular visitor of our website, you would know that we do not usually rave like this about a restaurant. 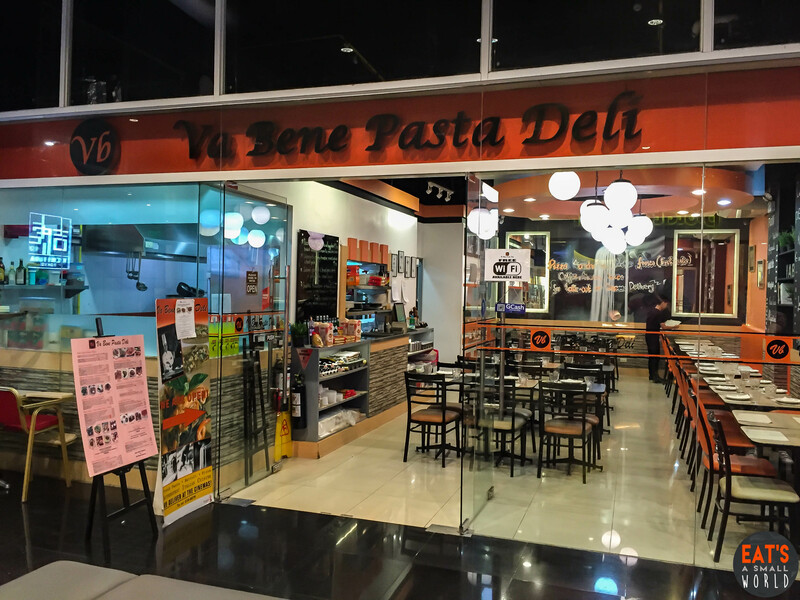 Yes, we do give praises but we would like to single out Va Bene Pasta Deli as one of our Top 10 restaurants (all categories considered) for its food, ambiance and service. 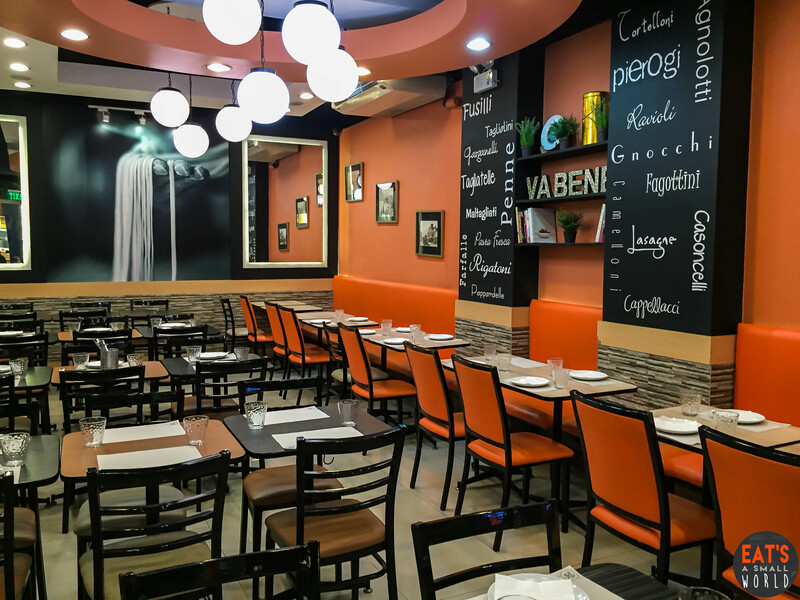 To us here at Eat’s a Small World, a trip from Quezon City to Makati and BGC to have lunch or dinner at Va Bene Pasta Deli is absolutely worth it, mainly because of the freshness of the food, good service and wide variety of Italian delights (not just the traditional pasta and pizza). Visit them. 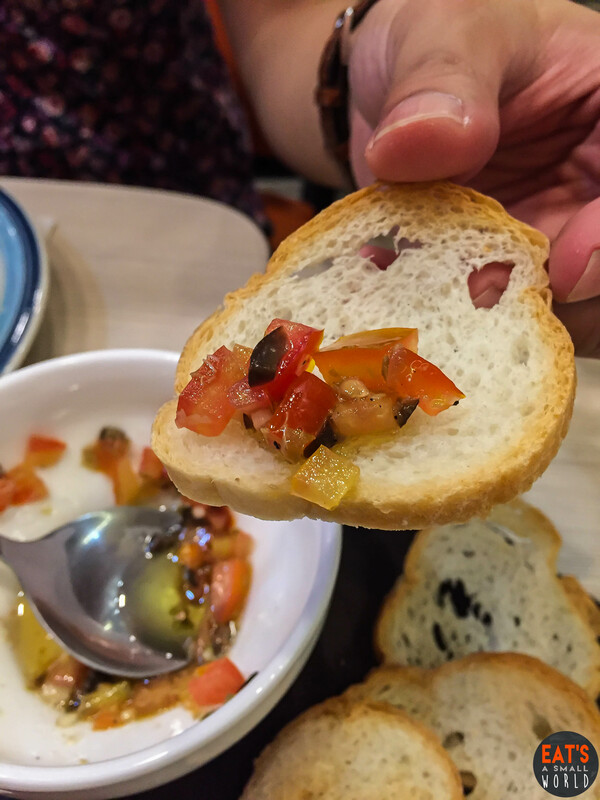 Explore and indulge in Italian cuisine because just like Filipino food, it is “talagang malasa” (really flavorful).